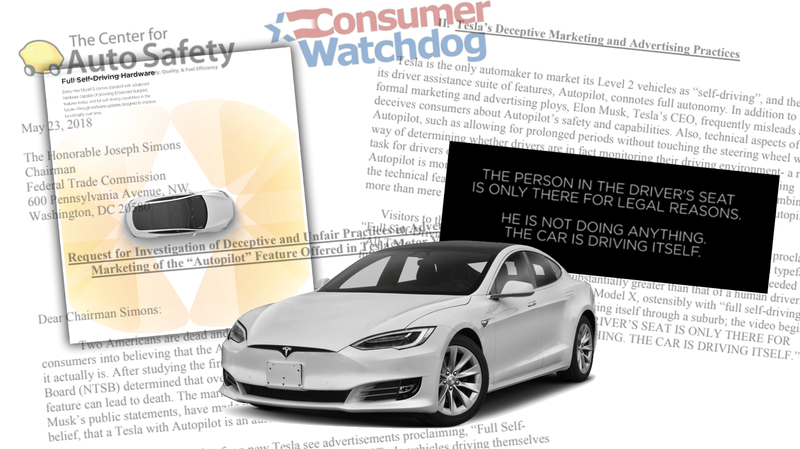 The consumer advocacy groups Center for Auto Safety and Consumer Watchdog called on the Federal Trade Commission today to investigate Tesla for “deceptive advertising and marketing practices and representations” made regarding Tesla’s Autopilot semi-autonomous driving system. The letter specifically points out advertising, statements, and marketing materials that give the impression that the Autopilot system is far more capable than it actually is right now. Tesla disagreed, and said its claims around Autopilot’s abilities are very clear. The bigger problem, and the issue being directly addressed by this request for investigation, is that Tesla’s marketing, advertising, promotion, and general attitude towards their Autopilot system seems to imply that it’s much more than it is, that it’s a full self-driving system, which it isn’t. What Tesla is saying is that its Model S vehicles supposedly have the hardware potential to have “full self-driving” in the future, but at the moment, they do not have that ability. It’s this descriptor that watchdog groups find misleading—they worry it could imply to less-savvy customers (of which, let’s admit, there are many) that the car can drive itself now or at least is capable of doing things it actually can’t. “Tesla is the only automaker to market its Level 2 vehicles as “self-driving”, and the name of its driver assistance suite of features, Autopilot, connotes full autonomy. In addition to these formal marketing and advertising ploys, Elon Musk, Tesla’s CEO, frequently misleads and deceives consumers about Autopilot’s safety and capabilities. Also, technical aspects of Autopilot, such as allowing for prolonged periods without touching the steering wheel with no way of determining whether drivers are in fact monitoring their driving environment- a required task for drivers of SAE Level 2 vehicles- deceive and mislead consumers into believing Autopilot is more advanced than it is. These formal and informal representations, combined with the technical features of Tesla vehicles, lead reasonable consumers to believe that Autopilot is more than mere driver assistance. The letter goes on to cite examples of Tesla and/or Elon Musk, via his personal social media accounts or statements made to the media, making Autopilot out to be safer or more capable than it actually is. The two advocacy groups claim that Tesla is in violation of Section 5 of the FTC Act (Unfair and Deceptive Promises) regarding how it markets and advertises the Autopilot feature, and they make a pretty compelling argument. The press release is here, If you want to read the letter in full, I have it posted below. It’s now up to the FTC to decide if an investigation of Tesla regarding this matter will happen. But a Tesla spokesperson countered by saying it’s been clear on what Autopilot can and can’t do, and said owners understand that. We’ll see what the FTC has to say about this matter soon. But all of this comes at a tough time for Tesla, which is also facing an investigation by the National Transportation Safety Board for various crashes, production issues with the new Model 3, labor issues, and a potential cash crunch. This story has been updated to clarify the nature of Autopilot’s warnings, and on the potential hazards of Level 2 AD cars.